RACING HOVERCRAFT | European hovercraft manufacturer. EUROHOVER manufactures exclusive super sports hovercraft for a select elite of enthusiasts. Space age materials and uncompromising quality both in finish and function make these crafts among the very best. They reach higher top speeds and weight less than any other produced hovercraft today. Designed without compromise using cutting edge technology. Both the hull and main components of a EUROHOVER RACING CRAFTS are made of extremely lightweight vacumed carbon fibre and kevlar composite. Its race-bred suspension system brings the driver in control of all movement, even under the toughest racing conditions.. We develope innovative technology which improves the performance, safety and desirability of our products. Specifications are rather vague as it is dependant on how fast you want to go and how much you can afford. We produce World & European Championship crafts. 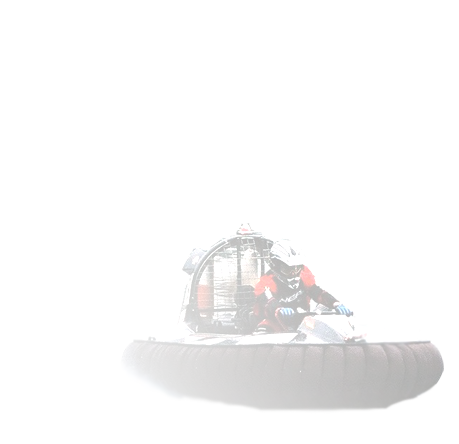 We can prepare hovercraft for F50, FS, F2, F1, ER racing categories. This are not a cheap crafts to build or maintain, there again neither is a or FERRARI KOENIGSEGG. If you are serious about owning one of these craft then contact me so we can discuss it.